I was super excited to hike Naksan Fortress right after watching Rooftop Prince episode 15 on Wednesday. It just happened that my mood was pretty somber and I decided to explore the place. from Dongdaemun station, Line 1 or 4, Exit 1 or 2. I failed to find Exit 1 so I went out from Exit 2 which was 50 metres away. from Hyehwa station, Line 4, Exit 1. 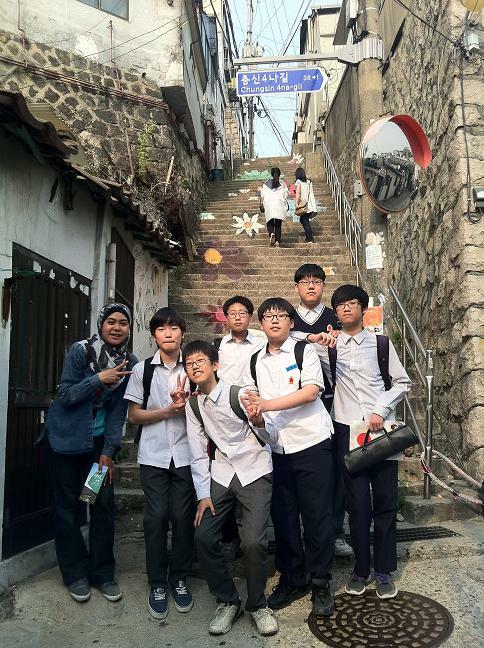 If you go from Dongdaemun station, you will meet Naksan Fortress first and so hiking you go! ^^ Bitter pill first and then sweet honey. If you go from Hyehwa station, you will meet many chic restaurants and shops, then the flower staircase (Ihwa-dong), then only the fortress. Sweet honey first followed by bitter pill. Either way has it's own attraction. I came to know about Naksan Fortress from the drama Gloria starring Bae Doo Na and Lee Chun Hee. 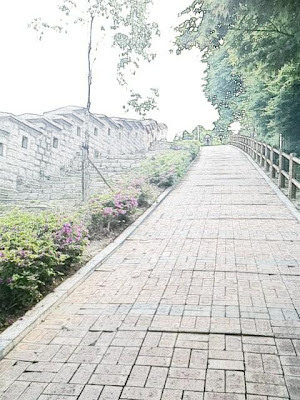 Lee Chun Hee's character always meet his lover secretly at the fortress so I thought "What a pretty hideout!" So right after watching Rooftop Prince, I was saying to myself "No way!! I just have to visit Naksan Fortress tomorrow!" The highlight of my trip to Naksan Fortress was when I met a few middle school students after eating my chocolate popsicle at a nearby playground. The staircase where Han Ji Min and Micky Yoochun walked! They gave me a tour of the place for FREE as they live there! Nice.. When I asked them "Do you know where is the filming location for Rooftop Prince?" Their answer "We don't watch dramas"
Then I asked "Then, what do you do?" They answered "Playing video game"